There are two basic ways to wrestle with recession risk. One is to forecast it, the other is to develop a high-confidence assessment of whether it’s stepping on the business cycle’s throat based on the data published so far. The world is awash with the former, and it comes with all the usual caveats, including a fair amount of error. That’s the nature of forecasting: accuracy is all over the place, and it’s up to the consumers of the outlooks to figure out who has the better prediction methodology. By contrast, calling the start of major downturns in the economy in the here and now, by using what we know rather than what we think will happen, is far less precarious (if the process is designed reasonably well). Eventually, all is clear… if you wait long enough. The gold standard on this front is the NBER’s official announcements on the dating of new recessions. Because NBER is striving for a very high level of accuracy—perfection, really—these announcements come well after the fact. 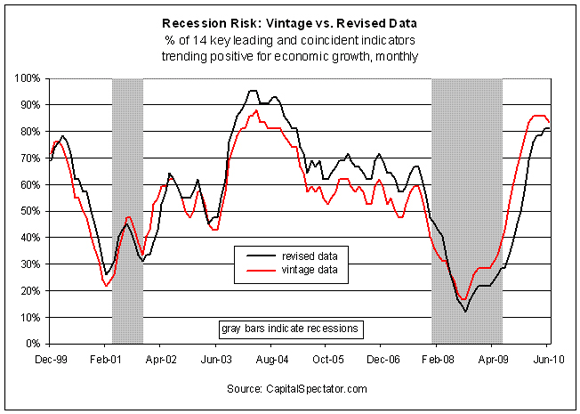 The cyclical peak of December 2007, for instance, was identified a year after the recession started. The advantage of the slow-moving NBER process is that you don’t have to worry about retractions. When they say the cycle peaked, you can be virtually sure that they’re right. But must we wait so long for clarity? The tradeoff in the pursuit of less ancient signals is that earlier calls on cyclical peaks must be paid for with accuracy. The earlier you attempt to declare peaks, the higher the possibility that you could be wrong. The challenge is figuring out how to maximize accuracy and minimize the signal lags. It wouldn’t hurt if the process is transparent, calculated with free, publicly available data, and is relatively simple and intuitive. High parameterized models may wow ’em at the next academic conference, but the record on complex systems isn’t encouraging. One possible solution that seeks to find a reasonable compromise is to focus on the key economic variables that published in a timely manner. That’s an inherently subjective task, but it’s par for the course in business cycle analysis—the economic gods have left mere mortals with the unpleasant work of conducting trial-and-error tests to figure out what is, or isn’t, relevant. With that in mind, I’ve created a list of 14 monthly leading and coincident indicators that have both empirical traction and academic support for assessing the ebb and flow of the business cycle (see the bottom of this post for a list). 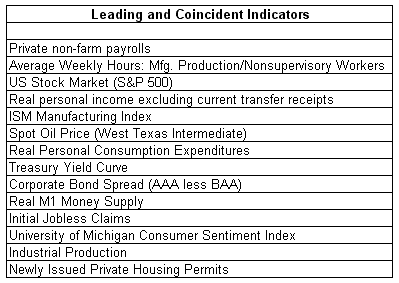 Each of these indicators has a productive record as it relates to capturing the broad fluctuations in the otherwise unobservable business cycle. The problem is that no one indicator is flawless—even for so-called leading indicators. On the assumption that it’s always unclear which indicator will stumble, it’s safer to look at an array of numbers to diversify this potential problem. In most cases, I’m looking at year-over-year percentage changes, calculated monthly. The two exceptions are the Treasury yield curve spread (used as an input based on its currently monthly average) and ISM Manufacturing Index (calculated as its current percentage difference relative to a neutral level of 50). There’s also some minor tweaking required for some numbers, such as inverting the signal from jobless claims (i.e., lower is better). The intuition is that annual changes in the key economic variables will capture most of the otherwise unobservable business cycle patterns. 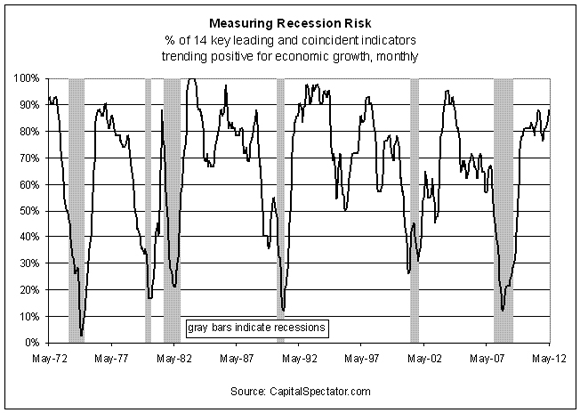 By looking at a broad mix of indicators, we’ll limit the potential for false signals about recession risk. Critics will say that this method for calling business cycle peaks may look accurate in retrospect, but in real time going forward (the so-called out-of-sample test) may falter. The world is littered with econometric evaluations that look promising on paper but disappoint later on. That’s always an appropriate caveat and it applies here. Indeed, the problem of data revisions is always lurking. Suffice to say, 100% accuracy is always elusive, no matter what you do (short of waiting for NBER press releases). Nonetheless, the revisions for the 14 indicators in the chart above may not be fatal. One reason is that the indicators are a wide-ranging lot and so the updates may cancel each other out through time, or at least keep the short-term noise to a minimum. Indeed, revisions aren’t uniformly positive or negative, particularly for a broad data set. A stronger reason for thinking positively that this index of 14 indicators can survive the revision challenge is that analyzing its record using vintage data holds up quite well. By “vintage” I’m referring to a number that was initially released for a given indicator—that is, before the data was revised. Finding vintage data isn’t easy, although the St. Louis Fed’s Archival Federal Reserve Economic Data (ALFRED) certainly lessens the burden. But ALFRED is missing a fair amount of the vintage numbers and so it’s necessary to dig through many press releases and other sources to fill in the missing pieces. A tedious task, to be sure, and one that revealed vintage data for all indicators in my index going back to only 1998. In any case, the effort is quite revealing. As you can see in the next chart, the diffusion index of our 14 indicators that’s calculated with vintage data tracks rather closely with the index based on revised numbers for the periods surrounding last two recessions. By the way, the analysis using vintage data runs as follows. In all cases, I used the current vintage numbers for each point in time. In those cases where the indicator is compared with its year-earlier reading, I used the revised data for the 12-month previous number (on the assumption that revised data is available a year later). As for the latest numbers, my diffusion index is effectively saying that a new recession didn’t start as of last month. Granted, that’s based on data only through May. What’s more, three of the inputs for last month (personal income and spending, along with housing permits) aren’t yet published and so I’m using April numbers as naïve estimates for May. In sum, don’t confuse this evaluation with a forecast. Rather, what the 14-indicator diffusion index is advising is that the business cycle didn’t turn, based on the numbers reported to date. Maybe the full set of June numbers will tell us differently. In any case, the future is unclear, but the recent past is quite a bit less murky. As for reading the numbers in real time, as released, it seems safe to say that the economy overall was growing as of last month, courtesy of my 14-indicator diffusion index. (A qualitative assessment is something else entirely.) In any case, reading the May data points overall implies that the Chicago Fed National Activity Index (a much broader measure of economy that will be updated on June 25) will also show that recession risk was minimal last month. Meanwhile, keep an eye on the Philly Fed’s ADS Business Conditions Index for a “high frequency” reading of recession risk. Not surprisingly, the latest update for this benchmark also suggests that the economy’s still outside of the red zone. No one should use these numbers as an excuse to ignore the very real threats that exist. A certain currency, for instance, that seems to be teetering on the brink comes to mind as a conspicuous problem for the global economy. Yes, another recession may be coming, perhaps for reasons that are obvious now. If the economy is destined for a fresh round of contraction, we’ll soon see clearer signs that we’ve slipped off the ledge. But for the moment, that’s still a forecast.